A young child’s first look at segregation and integration. Good for opening up discussions. Masterfully written and illustrated with powerful metaphors for social justice. Tolerance, kindness, and seeing points of view of others are lessons kids will take to heart and, hopefully, share with others. Or, as my daughter said after reading, “It doesn’t matter what you look like, it’s what’s on the inside.” A definite #classroombookaday. This book is so cute, simple, and powerful! Only downside, I wish I wrote it myself. This is the most amazing book!! A must read!! A book that can be used with a variety of ages and have different conversations about how we’re all special. Was reading this at #nerdcampMI and in the middle of reading it a teacher turned around to tell me that the boys in Thailand had all gotten out of the cave; I was reminded that there is potential for good in this world. This book reminds me so much of Leo Lionni's classic book from 1959, "Little Blue and Little Yellow. "The timeless themes are reinvented using bold and humorous illustrations. A great way for children to learn about colors, while getting an introduction to inclusion and diversity. When a picture book makes you tear up from joy and hope, that's a great book! This can serve as a great teaching tool about discrimination, segregation and the importance of diversity. It may be the greatest book about acceptance in the modern era. Distilled simplicity conveys the message of acceptance/tolerance/love to even the youngest readers. Its vibrant colors are a treat for the eyes. I have read this at 4 different family story times this week. Today, a little boy requested to check it out. Some children's books are so heavy handed with their message, but not Mixed. Arree Chung has a masterpiece on his hands. Yellows, Blues, and Reds live peacefully in a city, until one day, a Red declares, "Reds are the best!" The whole community is thrust into chaos -- so much so that the three color groups must live apart, forming new towns. One day, Blue and Yellow are seen together with a new color...what will become of the union? 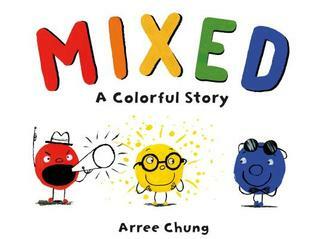 Arree Chung shows us a world of colors, teaching us about tolerance, and how "mixing it up" might just be the best thing for everyone. How do you first talk about being multiracial with your kids? This is a great start to help any family talk about how wonderful diversity is, and what a challenge it has been for us. Not something I'd pick for storytime, but a needed book for so many of my families! Should be in every preschool in America! Can't wait to share this! Ages 3-6. Less about color mixing and more about societal acceptance of different people mixing and enjoying the world together. I'm sure it's better than my rating indicates, but I expected something different. Ads for this story of diversity and multiracial identity kept popping up in my newsfeed, and got me excited. Maybe it was overhyped, but I somehow expected more. I liked Spork by Kyo Maclear better. Colors should be separate! Or should they get together and create new, even more beautiful colors? They should stay in their own neighborhoods! Or should they create wonderful neighborhoods together? I’m probably being overly critical, but I don’t like the oversimplification that “mixing” will solve all of our divisions. From an art perspective, I’d rather it was more explicit about how colors mixed and what they create. All that being said, my multiracial children loved it.